Description: The two eye-catching tiers of Whitestone Idalight featured in this Jayne Pendant reveal a highly fashionable aesthetic that is hard to resist. Clean sophistication and a stunning architectural look astound with round surfaces and straight line accents while providing an effective source of ambient light. The Grandiose styled fixture is enhanced with Antique Iron Ore finished hardware. Handcrafted by highly skilled artisans in our manufacturing facility in the USA. Dimmable energy efficient lamping are available, as well as custom sizes, styles, and colors. 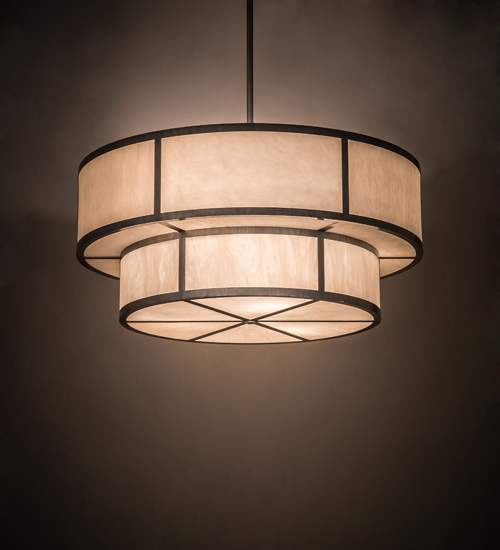 The 4-foot wide pendant is UL and cUL listed for damp and dry locations.